I usually make my own salad dressings. It's easier to control what goes in it, and you can adjust the flavors to your own preference. When I saw that Marzetti Simply Dressed salad dressings were being offered to review by Foodbuzz Tastemaker, I decided to give it a try. 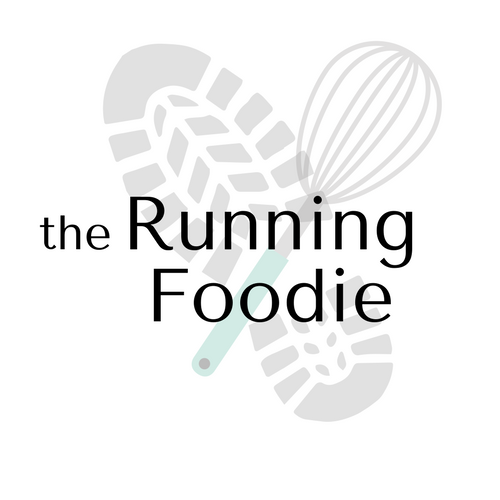 The reason why I was curious was because Simply Dressed is all natural, made with real cheese, extra virgin olive oil, and no additives (save for xanthan gum and cultured whey). The flavor is really tasty, without an overwhelming, heavy blue cheese. The texture is thick, but not too globby. Mixing this dressing with roasted garlic would make it taste even better. 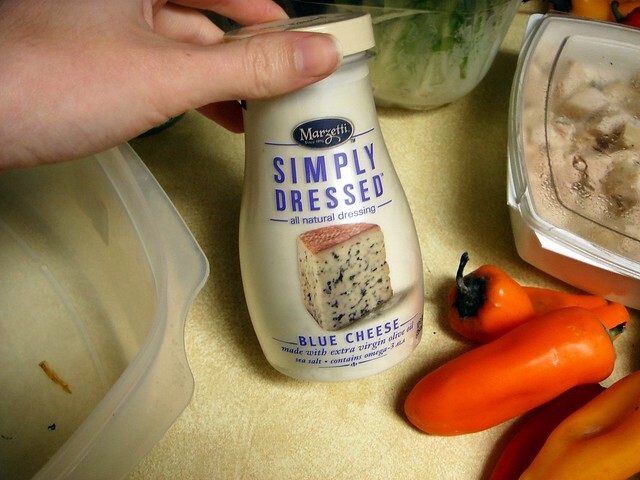 They have a decent selection of flavors, like Greek Feta, Champagne, and Ginger Sesame, so if you're ever in need of a natural, flavorful store bought dressing, Marzetti is a good brand to try. I made a simple layered salad that I topped with the dressing for dinner last night. 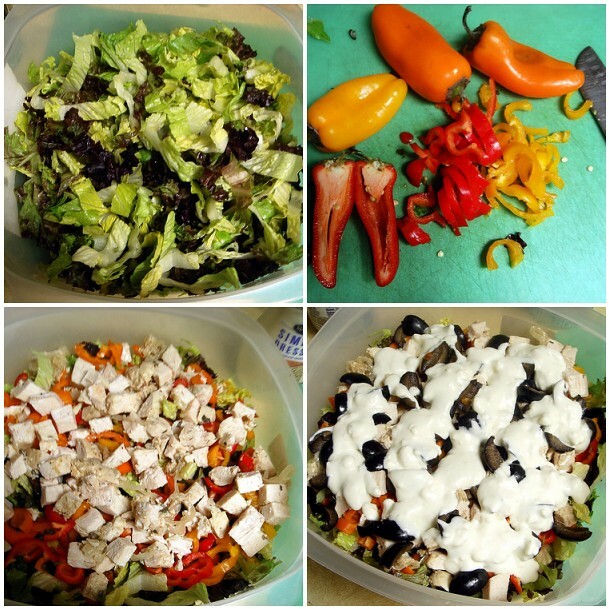 Two different lettuces were chopped and layered with sliced bell peppers, chopped chicken, black olives, and then the dressing. 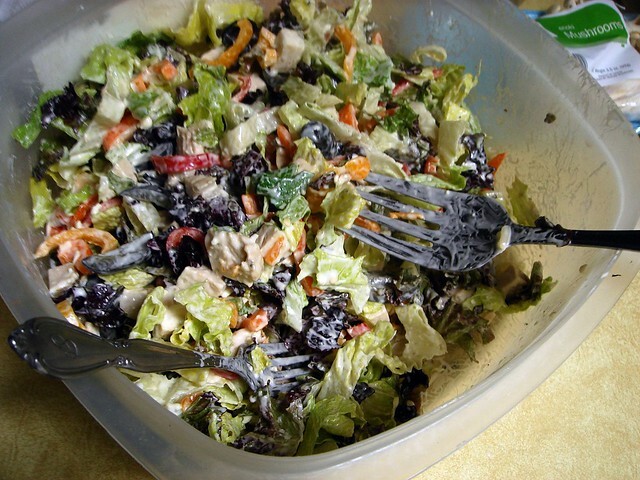 The salad was covered and refrigerated for an hour. I'm not entirely sure what the point of a layered salad is since it all gets tossed together, but I think it's made in such a way so that the lettuce stays crisp while the ingredients are chilled. Usually, the lettuce starts to wilt once it's coated in dressing, though that usually only happens at room temperature. It's nice to be able to make a salad in advance. wow what a yummy salad and very colorfully. the pomegranate vinaigrette is really good too!